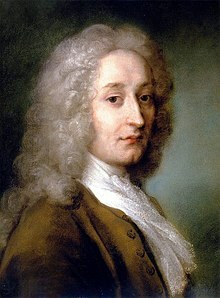 Jean-Antoine Watteau (10 October 1684 – 18 July 1721) was a French painter. His brief career spurred the revival of interest in colour and movement in the tradition of Correggio and Rubens. It brought back the almost forgotten Baroque idiom, which, in time became known as Rococo. He invented the genre of fêtes galantes: scenes of bucolic and idyllic charm, with an air of theatricality. Some of his best known subjects were drawn from the world of Italian comedy and ballet.